Pulsations (Pulses) Magazine is not about music at power rhythm, but the music of the body. 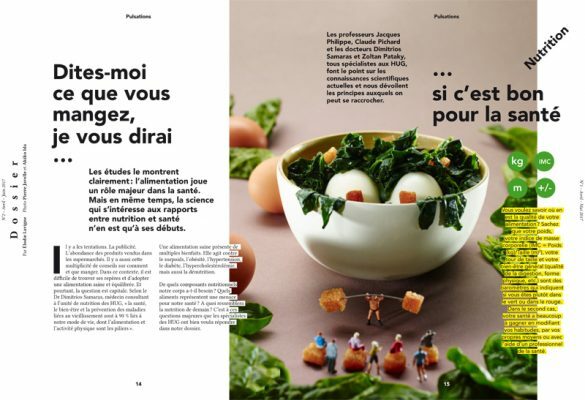 This magazine is published by the University of Geneva* and Treaty and talking about health. The subject that prompted the drafting to pick us up for the illustrations is Nutrition. *Switzerland. A beautiful magazine really well put page and where the printing is without lying: beautiful. So very proud to have been able to contribute to a medical magazine, which is far from being off-putting, and nevertheless very serious.